This section describes miscellaneous features offered by the UI client. 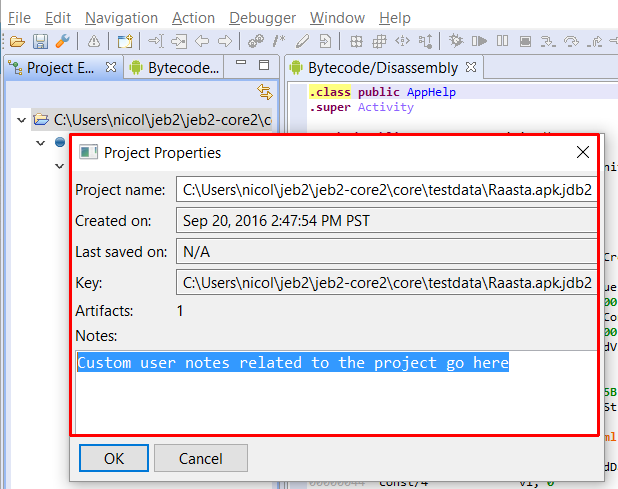 A JEB project can be persisted to a file on disk called a JEB Database file. 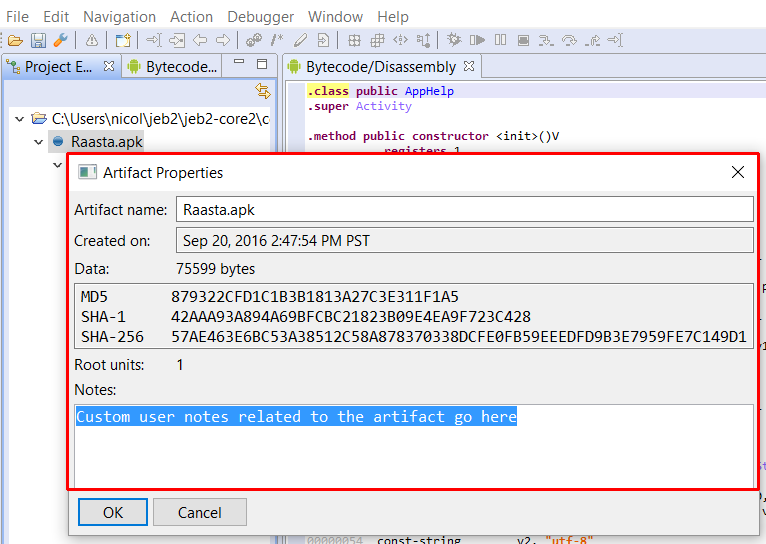 They have a .jdb2 extension. 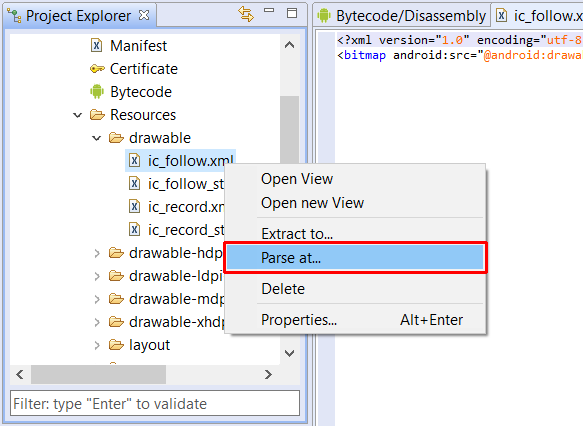 JDB2 files can be shared among users, and reloaded later on. They can grow significantly larger than the original artifact(s), as they contain the analysis results for all - or most of all, see below - units in your project. They are encrypted and compressed. Make sure to load a JDB2 with a version of JEB equal or newer than the one that generated that JDB2. Each JEB plugin/module is responsible for providing persistence of their result units. All PNF Software modules support persistence. 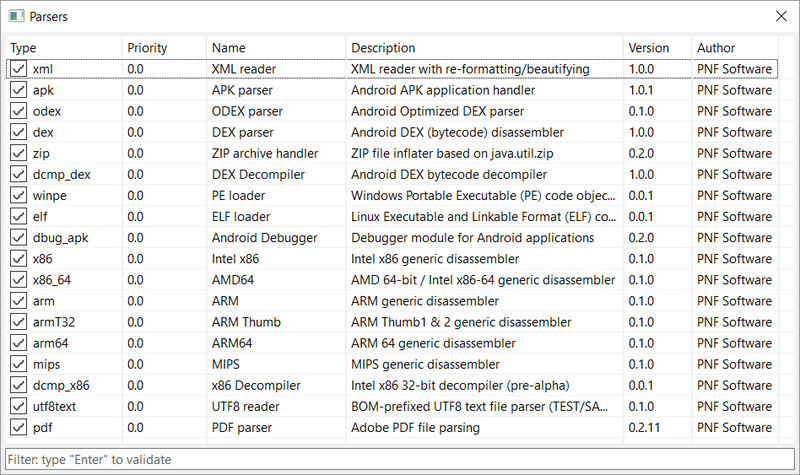 The analysis of large artifacts, yielding potentially hundreds or thousands of units, can translate into very large JDB2. For such projects, the UI client may offer the user to "quick-save" instead of performing a "regular (full) save". Quick saves are almost instantaneous, and generate lean JDB2 files. However, not all data is persisted in QuickSave JDB2. At the time of writing, QuickSave is supported for APK/DEX units and Native Code analysis units. See the back-end property .project.PersistenceStrategy to customize this behavior. Notifications are generated by modules when they encounter areas of interest during analysis of their input data. 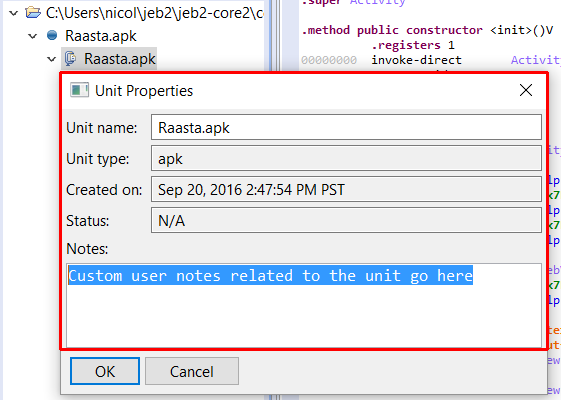 The menu entry File, Unit notifications allows the user to view notifications for all units produced in the currently opened project. AREA_OF_INTEREST A generic type to signify an area of interest within a unit. CORRUPTION Input corruption has been detected. DEPRECATED_FEATURE The unit has detected features that have been deprecated. ERROR A generic type to signify an error in the unit. INFO A generic type similar to AREA_OF_INTEREST. MALICIOUS The intent is malicious. POTENTIALLY_HARMFUL This type indicates usage of a feature not recommended by guidelines due to its potential dangerousness. UNSUPPORTED_FEATURE Some input cannot be parsed because of a limitation within the unit itself. WARNING A generic type to signify a warning in the unit. Note: See this reference page for additional details. Export some or all decompilations. Export the active fragment to raw text or html (with coloration similar to JEB's text views). 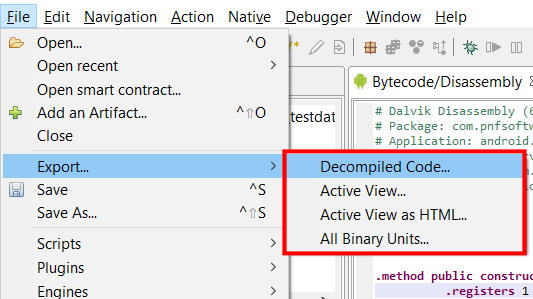 Make sure to focus a code view or a decompiled code view before attempting to run this command. This command is accessible via the File, Export menu entry. The properties of a project can be examined by right-clicking the project node in the Project Explorer view, via the File menu, or by using the Alt+Enter key combo when the project node is selected. The name is customizable. 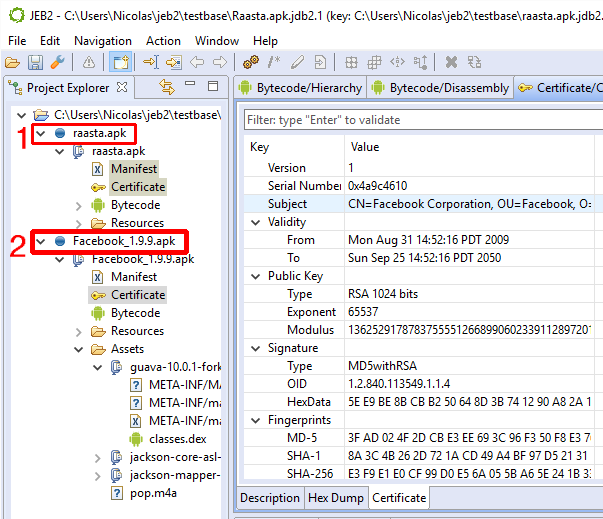 The default name is always derived from the primary artifact, with a JDB2 extension. This extension stands for "JEB Database Version 2", and represent a serialized version of your project which users can save and load on their JEB version 2 software. The creation and modification timestamps are read-only. The user-notes are obviously writeable and saved with the JDB2. Similarly to Project properties, the properties of an artifact can be examined by right-clicking the artifact node in the Project Explorer view, via the File menu, or by using the Alt+Enter key combo when the artifact node is selected. Similar to Project and Artifact properties, the properties of a unit can be examined by right-clicking the corresponding unit node in the Project Explorer view, via the File menu, or by using the Alt+Enter key combo when the unit node is selected. The unit name is customizable, however, we recommend users to not change unit names. The status field indicates potential problems: N/A means the unit was processed properly, and its contents can be examined; other string messages can be reported by modules to indicate processing error, or simply, lack of processing in the case of lazy processing. The full list of input processor plugins (whose term was simplified to parsers in the UI) loaded within your JEB instance context can be seen by running the File, Engines, Parsers command. Parsers can be selectively disabled if you would like JEB. 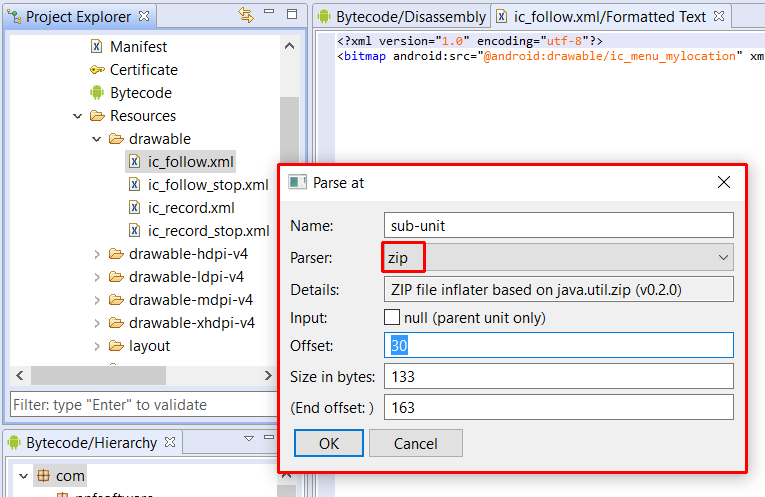 For example, if you would like JEB to not process ZIP files as such (ie, treat them as plain binary files), you may disable the zip parser. Note: technically speaking, parsers are JEB plugins that implement the IUnitIdentifier interface. Refer to the "Developing with JEB" section of this guide for more information. Reparsing allows a user to (re)parse a unit or parts of a unit by specifying explicitly what the input data should be parsed as. Reparsing can be helpful when dealing with complicated, obfuscated, or multi-layered files.